I chose to try a colored manga splash page based on the a few styles of the Year 24 Group. I have trouble drawing typical shōjo style casually, so I wanted to try it for a piece. As the artists chosen had to be from the 20th century, not the 21st, I decide to look at the foundations of the genre and borrow from prominent artists from then. I found Year 24 Group, a group of female artists born in or around 1949 — Showa Year 24 — who wanted to create manga for older girls and defined a lot of typical shōjo tropes. In particular, I took inspiration from Keiko Takemiya’s style of hair and colorful backgrounds, Yukiko Kai’s style of drawing bows, and Riyoko Ikeda’s level of detail. From what I can read from their appearance, color pages for manga, when on paper, are done in marker and ink, and on manga paper. Since good coloring markers are extremely expensive and I don’t own any, I substituted watercolor, as I felt I could best imitate the layered look with it. Regular drawing paper wrinkles when painted with watercolor, so I opted to use painting canvas pad. As we had to incorporate something from Tokyo Metro into the piece, I chose to paint the Tokyo Skytree as part of the background. I loved how futuristic it was, especially when lit, so I felt it would be a good contrast to the older style I was imitating. 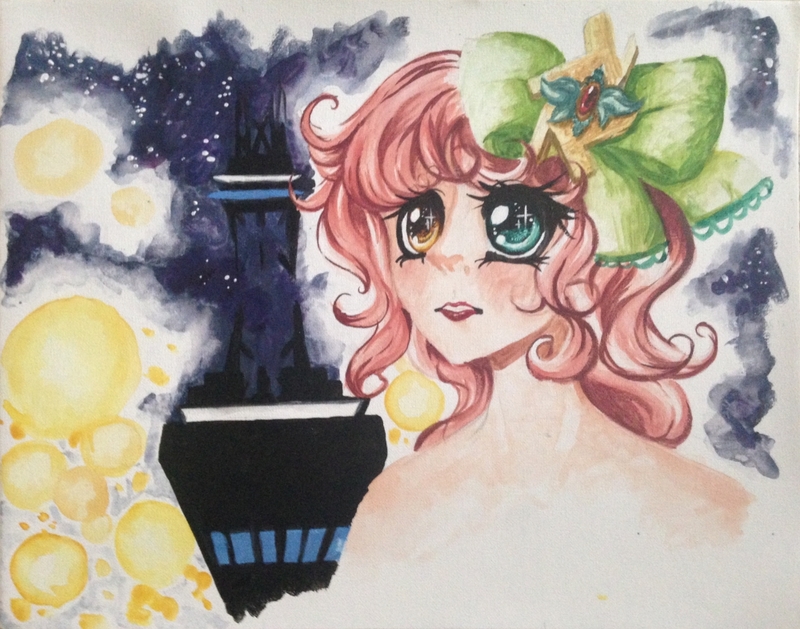 It also created a good excuse to paint shōjo bubbles and the night sky. This entry was posted in Non Time-Based and tagged 20"x16", Japanese Media, Manga, Real Canvas Pad, Watercolor. Bookmark the permalink.